Audinate’s Dante protocol is rather quickly taking over the audio world. 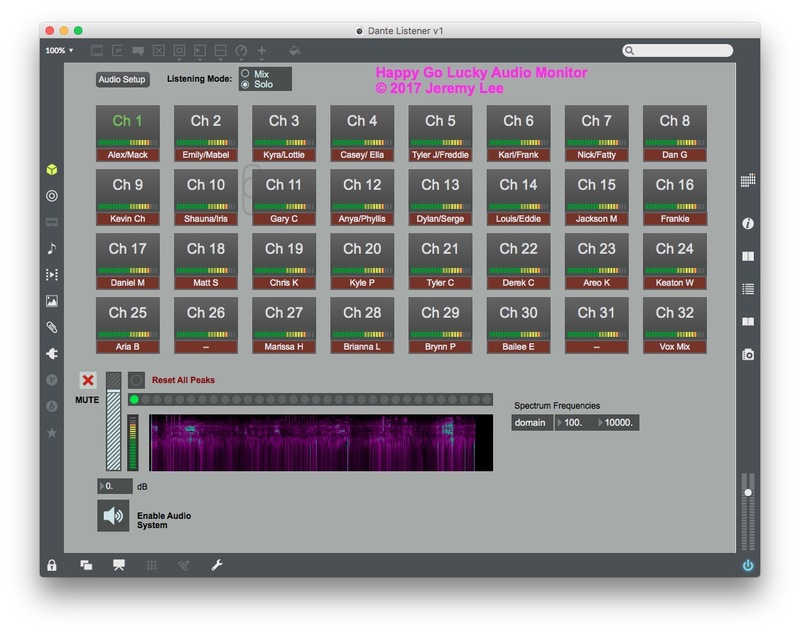 We now have hundreds of audio connections happening on a standard network on our productions. Yamaha’s CL series relies on the Dante protocol exclusively for all of their inputs and outputs. We even have companies like Shure creating wireless microphone systems that are fully digital from the transmitter to the console via the Dante protocol. The issue that comes up with these systems is how do we monitor a Dante audio stream during a show? A company called Wavemark has created an amazing tool called Wavetool. It is, however, not a cheap piece of software. I created my own basic Dante Listening application with MAX/ MSP. All you have to do it create an aggregate device in OS X with Dante Virtual Soundcard, patch it up in Dante Controller, and plug in a set of headphones to your computer. It currently requires a full version of MAX to run reliably. Give it a go!